American Airlines is capitalizing on its post-Chapter 11 freedom, as well as US Airways merger, to grow its network out of LAX by adding two transborder flights to Vancouver and Edmonton, as well as links to both San Antonio and Tampa. The additions follow a major expansion by American in 2013 that added services from LAX to Pittsburgh, PA, Indianapolis, IN, Columbus, OH, Hartford, CT, Fayetteville, AR, Eugene, OR and Redmond, OR. Combined with US Airways, American has grown to become the largest carrier at LAX measured by % of seats, as well as ASMs. American Airlines president Scott Kirby remarked that LAX had been “nicely profitable” for the carrier in 2013 and thanks to its share of the premium market. Unlike three of its other cornerstone “hubs” that pre-merger American is bringing to the table as it unifies with US Airways, LAX is not being included in the “rebanking” hub process that is taking place at Miami, Dallas/Ft. Worth and Chicago O’Hare commencing in fall 2014. The “banked” hub-and-spoke system, adopted decades ago under former CEO Robert Crandall, shies away from relying upon a rolling hub throughout the day to several “peak” ones instead, designed to maximize connectivity. American adopted the rolling hub practice post-Crandall era to relief pressure on its rising cost structure, as a rolling hub allows for an airline to maintain high productivity levels at its hubs throughout all hours of the day, and increase aircraft utilization by spreading flights throughout the day. Passengers are permitted to book itineraries with shorter minnimum connection times (MCTs) under a rolling hub system, but this will change with the banking system as it will result in longer aircraft taxi times and more crowded terminals at peak hours. The movement away from the rolling structure and towards the bank structure indicates that American is more focused on chasing revenue opportunities at its three largest hubs. Elsewhere across its network, particularly in LAX and New York, the dynamics are different as American focuses more on capturing O&D traffic over connecting traffic. American hasn’t outlined plans yet as to what it intends to do with the hubs it will inherit from the US Airways side of the fence in Charlotte, Philadelphia, Phoenix and Washington Reagan. The new additions at LAX will be targeting both monopolized routes by a single carrier (such as Edmonton and Tampa) as well as more fragmented ones, such as Vancouver, and to a lesser extent, San Antonio. Schedules in CAPA Innovata show that WestJet has the sole monopoly on LAX-Edmonton with a daily service operated on a 737NG. Between LAX and Tampa, Delta offers a daily 737-800 service during the high season, but reduces frequencies to less than daily during the parts of the fall and winter period. LAX-San Antonio is served by both Southwest and United, with each carrier offering roughly 2-3 daily flights apiece depending on season. Southwest owns a slightly larger portion of the market share at roughly 57% compared to United, but United uses smaller-guage 2-class CRJ-700s while Southwest uses its unified cabin 737s. Southwest also markets many of its LAX-San Antonio flights as “direct” services originating in another market, such as Dallas Love Field, which therefore has an affect over how much of the O&D travels on it vs. competitors as well as the nature of the yields it commands on the route. Vancouver – LAX by far is the most fragmented with four carriers currently offering nonstop service: Alaska, Air Canada, United and WestJet. Alaska offers the largest amount of capacity and dominates roughly 40% of the market share, followed next by Air Canada at 31% and then WestJet at 25%. United, however, maintains a paltry 4% of the market share, despite the fact that LAX is a hub for the carrier, and Vancouver is a Star Alliance hub via partner carrier Air Canada. While American’s contributions to the LAX-Vancouver market will not add a high level of frequencies, the carrier is likely incentivized to siphon premium traffic away from Star competitor Air Canada, which recently announced it would convert its LAX-Vancouver service to Air Canada Rouge, a low-cost subsidiary carrier which launched in late 2013. Rouge will likely reduce the number of premium seats offered to the market and appeal more towards the leisure traveler, but LAX-Vancouver is already saturated as-is with leisure competition in the form of hybrid carriers such as WestJet and Alaska. 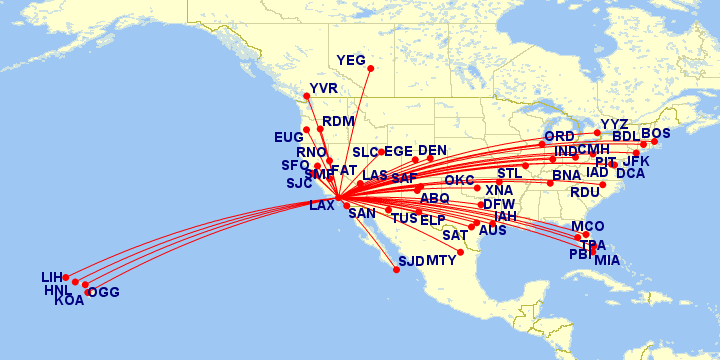 Even though American codeshares with both carriers, including on a few transborder routes, American has likely determined that Vancouver is a necessary spoke to connect to its growing base at LAX to strengthen its appeal as a palatable hub carrier. The next logical adds from LAX would likely be to corporate markets that have yet to be penetrated by low-cost carrier and hybrid competition and that have also recently experienced withdrawal from network carrier presence. Such possibilities would include Cleveland, Ohio, Minneapolis/St. Paul, MN, Atlanta and Detroit. Cleveland recently was downgraded from hub status to focus/spoke by United, and while the carrier has experienced a surge in low-cost carrier competition to pick up the slack, the market merits full-service provisioning to key select cities. With LAX-CLE monopolized by United, the next logical add would be a 2-3 daily service on an American Airbus A319 to gain some traction among OneWorld elites in the LA Basin. Minneapolis/St. Paul, Atlanta and Detroit also merit fortified OneWorld presences with ties to Southern California, being currently dominated by SkyTeam as Delta hubs. American may also want to revist the idea of expanding into more transborder and Central American markets to the South, as competitor Delta and United have done in recent years. Currently, Delta flies from LAX to Belize City, Cancun, Guadalajara, Guatemala City, Leon, Liberia, Mazatlan, Puerto Vallarta, San Jose, San Salvador and Monterrey. United flies to Cancun, Guadalajara, Leon, Mexico City, Puerto Vallarta, San Jose del Cabo and Durango. Of course, American codeshares with Alaska Airlines and Horizon Air on select routes from LAX to Mexican beach resort markets and a few key business and VFR destinations, but there is room for American to grow and compete in a few more Latin American destinations from LAX. One of the larger questions looms over how much growth LAX will experience from AA at the expense of its Phoenix hub (if at all), which it will acquire from the US Airways merger. Given its high volume of O&D, Phoenix will likely retain hub status with the new American forging ahead, but its current level of frequencies and aircraft guage will likely see reduction due to its proximity to LAX, its geographic positioning in the Southwest region of the country, and the nature of its yields (largely leisure and tourism-based traffic). However, one possible growing feather in American’s hat at its Phoenix hub is the rising cost structure of its #1 competitor, Southwest. Although far from parity, the nature of the cost structure between the two airlines can have a powerful influence over the ability for one carrier to outmaneuver the other when it comes to matching fares and inventory. According to CAPA, in Q1 2014, American recorded 9.75 cents USD in unit costs, while earning 15.67 cents USD in PRASM. During the same quarter, Southwest’s unit costs were 8.50 cents USD and its PRASM stood at 12.90 cents. Absent of Southwest’s international network, which represents less than 1% of its overall systemwide capacity, the carrier offers roughly 3.4 million weekly seats within the continental United States. American offers 4.1 million seats. Certainly, American’s large international network, premium class cabin, variegated fleet, massive presence in large corporate markets, global alliance and codeshare agreements all provide massive revenue returns over a much more simplified carrier such as Southwest. However, those advantages provide American with padding against fare pressure at Phoenix created by Southwest, especially if its unit costs are low enough to keep Southwest’s pricing tactics in check.